Well-known broadcaster and current RCSI medical student, Máire Treasa Ní Cheallaigh, took time off from her studies this evening to launch Aistear tríd an Inchinn in the new RCSI building at 26 York Street. Well-known for her work in the area of psychological performance Máire Treasa was well suited to launch this book and was unstinting in her praise for the publication. The brain is our most important organ and perhaps the least well understood. It’s the command station for our body controlling what we think, what we feel and what we do. This colouring book seeks to increase our understanding of the brain in a succinct engaging way using text, images, brain maps and cartoons. It will give second-level pupils and adults alike an insight into how the brain works and into its central role together with the nervous system in directing how our whole body operates. Colouring books are increasingly popular today and used widely in the development of mindfulness and well-being. 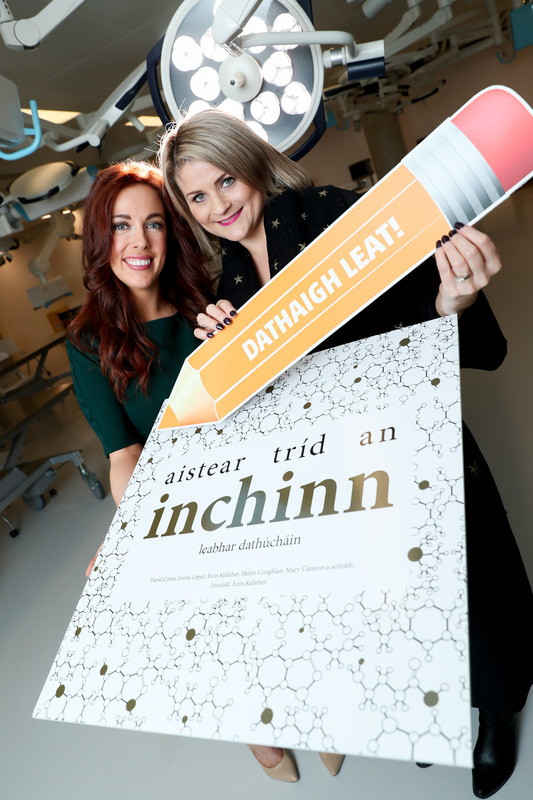 This book will be a welcome Irish language resource in these areas. Originally published as Journey through the Brain authored by researchers from the Department of Psychiatry in RCSI (Royal College of Surgeons in Ireland) with grant assistance from the Knowledge Exchange and Dissemination Scheme of the Health Research Board.